OPEN BIM helps the development of this gigantic mixed use project in Helsinki, Finland. 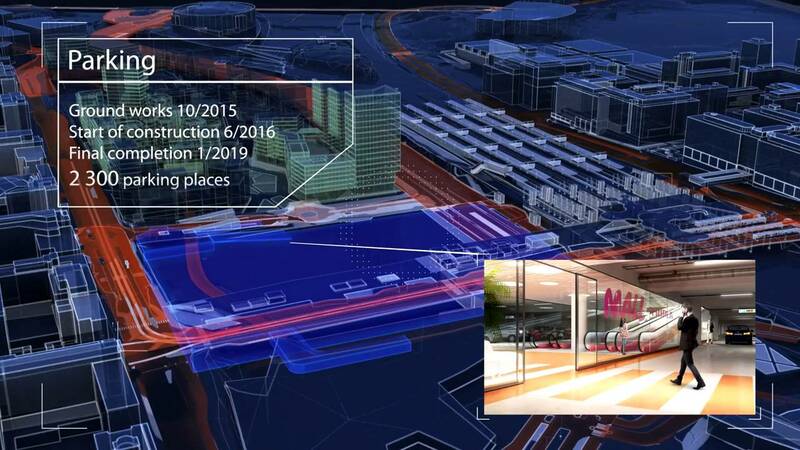 Tripla will be a bold, three-block urban entity connecting East and West Pasila, which had been separated by an old railway yard. The overall design will comprise offices, a shopping mall and congress center, housing, a hotel, a multi-purpose arena and public transportation terminal. The development is committed to continuing the sustainable expansion of the Helsinki city center, while creating a new, diverse backdrop for Helsinki urban life. The solution is based on an analysis of the history and scale of the urban structure of Helsinki. Helsinki has grown to its present size as new city districts have joined the inner city street grid, with variations typical for their time. The new center of Pasila continues this urban structural tradition, code and scale typical for Helsinki, which started in the early 19th century. The concept of the new cityscape was to continue the Töölönlahti area, a central park with cultural buildings. Could this green ‘spine’ be leveraged by opening a growth corridor for it northwards all the way beyond Pasila? The center of Pasila could become an urban structural element that supports this idea. Due to its central location and easy accessibility, Tripla is an attractive place for an exceptional variety of activities. As a basic solution, Tripla will be a bold, three-block urban entity that connects East and West Pasila, which had been separated by an old railway yard. The overall design will comprise offices, a shopping mall and congress center, housing, a hotel, a multi-purpose arena and public transportation terminal. Housing will account for approximately 20% of total building area. Part of the housing will be rental and for senior citizens. Overall, the area will be economically, socially and ecologically sustainable. The sizes of the spaces have been based on market analyses, so that the project can be implemented in a single stage. The basic character of Tripla is public, open and serving all groups. The entire spectrum of life - the meeting point for different values, lifestyles and age groups and social interaction - was one of the most important guidelines in the design process. In the implementation, these objectives are evident primarily at the human scale, as a vibrant environment that does not attempt to grab attention with trendy architectural design but rather is committed to continuing the expansion of the Helsinki city center in the direction of Pasila. At the same time, it creates a new, diverse backdrop for Helsinki urban life. In the very beginning of the project, the client stressed that all designers must follow Common BIM Requirements by BuildingSMART Finland, level 3. The project’s BIM coordinator created a detailed BIM execution plan for the entire project to fulfil CoBIM requirements and convey how specific information should be produced and maintained in the models. IFC files that are produced from all design disciplines are brought together in Solibri Model Checker in weekly or bi-weekly cycle; this combined model is used in everyday work for quality control and to solve design challenges in the project meetings. Adapting and unifying the IFC information for the client or different design teams is straightforward and easy when using ARCHICAD. All project files are stored in one repository (cloud) and any file exchange happens through this portal. There are over a hundred designers from different disciplines working on this project. In addition, there are client’s personnel and organizations of the city of Helsinki and the state, which make over 300 individuals altogether. All of them have access to at least some of the project data. This is possible only with a web-based solution. AS&H is a Finnish architectural practice founded in 2007 by architects Kalle Soini and Sami Horto, with a head office based in Helsinki, Finland. Their core competencies are architectural design, project management and property development. They supply the full chain of services from the entire design team management and on-site supervision to facility management systems. The company operation unifies the long-term professional experience from the fields of construction, property development and architecture. Their team of Lead Architects have completed projects in Germany, Russia, Sweden, Estonia and Finland. They have earned their reputation with a long-term commitment to study, learning and understanding their clients’ businesses. Their reward is a returning customer with new projects to complete together. With trust, they can truly help their clients to achieve their goals. Their clientele consists of large international construction companies, national pension funds, insurance companies and developers. All appreciate their capability to understand their business models and their capability to deliver flawless documentation for each phase of the construction process. YIT leads the way in the construction field. YIT creates more attractive and sustainable urban environments by building housing, business premises, infrastructure and entire areas. YIT has a strong market position: it is the largest residential construction company in Finland and the largest foreign residential construction company in Russia. YIT is also one of the largest business premises and infrastructure construction companies in Finland.